Two weeks ago, Dove sent me a cake to celebrate my age. It is a beautiful campaign that inspires women to celebrate their age, and always feel beautiful inside. Anyway, for those who are celebrating their birthdays and celebrating their real age, here's a birthday discount promo from Nui - a luxurious restaurant from the same team that brought us the much-loved Vikings! 1. 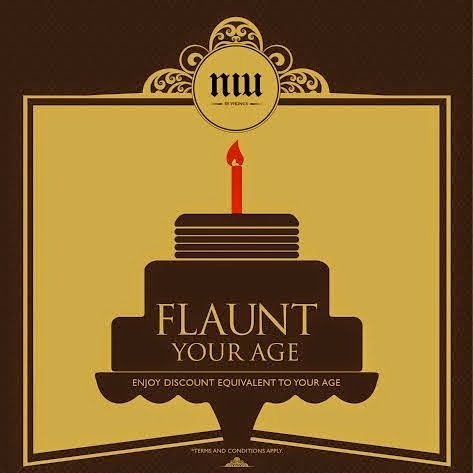 Birthday celebrators of all ages can avail the NIU birthday promo, “Flaunt Your Age,” on the day itself or on their birth month. 2. Celebrators will get a discount equivalent to their age on any day of their birth month on both lunch and dinner, as long as accompanied by ONE FULL PAYING ADULT. 3. One full paying adult are adult guests who will be paying full rate without any discounts. 4. Requirements for Celebrators: Celebrators must bring an ORIGINAL and VALID government issued picture I.D. with the birthdate imprinted on it, both local and foreign I.D.s are accepted, for proof (such as S.S.S., N.B.I., Driver’s License, Pag-Ibig, P.R.C., Barangay, Unified, Police Clearance I.D. and Passport) In the case that the celebrator doesn’t have a government issued picture I.D., he/she may bring his/her birth certificate supported by any picture I.D. (school I.D., parent’s I.D., company I.D.). 5. This promo can’t be used in conjunction with our current promotions or discounts. 6. This promo is available at NIU by Vikings, Level 6, SM Aura Premier. 7. This promo is valid until March 31, 2015. Win a Nikon Lens Mug!